The Campbell Hausfeld 1/2-inch twin hammer impact wrench (TL140200AV) is designed for DIY projects and general-purpose applications such as automotive maintenance and repair. 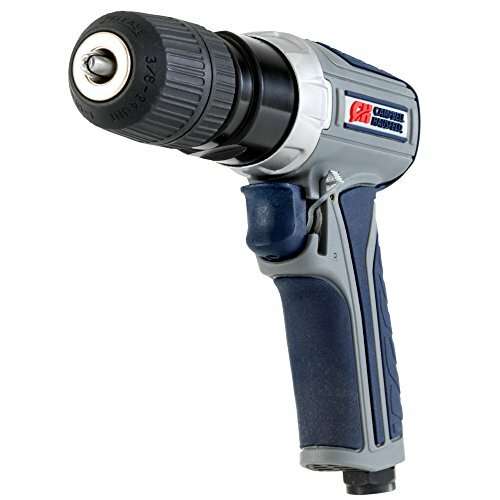 A twin hammer mechanism helps this impact wrench deliver up to 550 ft.-lbs. of torque with reduced vibration. A soft comfort grip helps reduce fatigue. Not intended for assembly line applications or commercial usage. Finish your projects faster and easier with Campbell Hausfeld - The Air Power Expert. 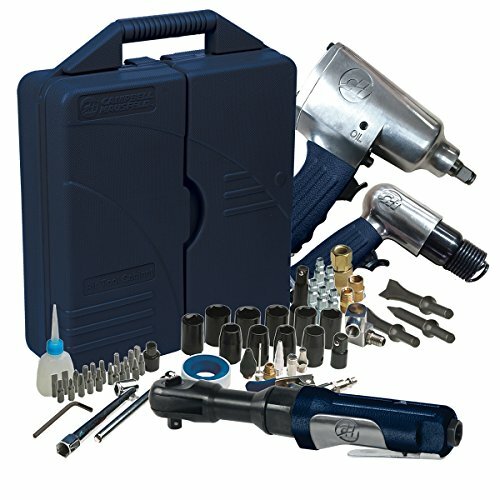 The Campbell Hausfeld 17-piece industrial accessory kit (MP284700AV) is a perfect addition to any air compressor or air tool. 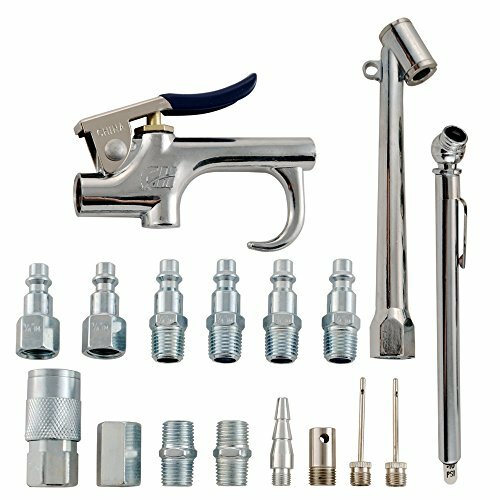 This accessory kit includes a blowgun, 5 – 50 PSI gauge, dual-foot chuck, 1/4-inch NPT (F) coupler, (4) 1/4-inch NPT (M) plugs, (2) 1/4-inch NPT (F) plugs, female coupling, (2) male couplings, (2) inflation nozzles, safety nozzle and tapered nozzle. 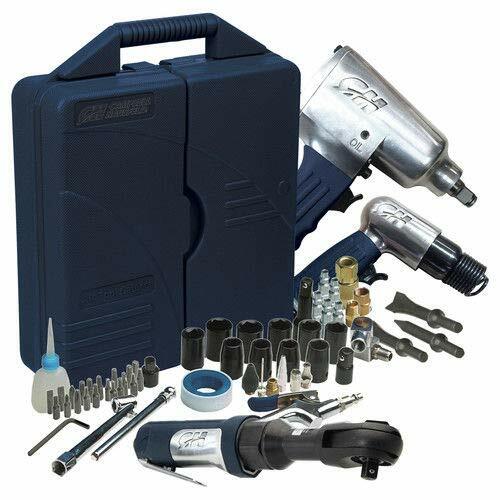 This kit is a must have when tackling any projects involving your compressor. Finish your projects faster and easier with Campbell Hausfeld - The Air Power Expert. The Campbell Hausfeld get stuff done reversible air drill (XT401000) meets all the challenges of surface prep and drilling with ease. Changing bits and installing accessories are easy with the keyless chuck design. Additionally, an easy side-toggle makes moving from forward to reverse a one-handed task for convenient use. 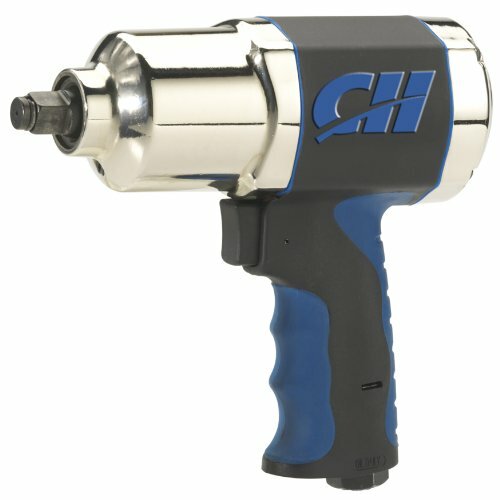 The air chuck boasts a 30 ft. Lbs maximum torque and a free speed RPM of 2, 000 to get jobs done efficiently. Drill shank range of 3/64 – 3/8”. average air consumption of 4.0 CFM @ 90 PSI. Single planetary gear type. 0.4 Horsepower. 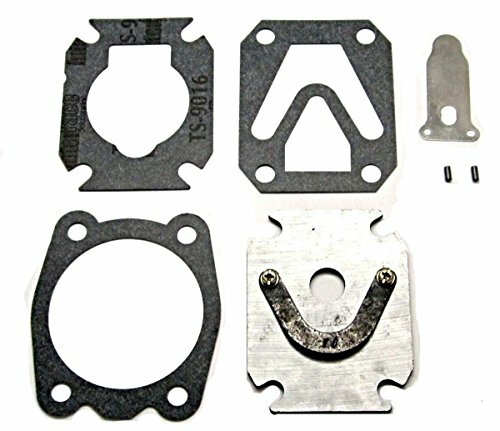 Air inlet size of ¼ “ NPT (F). an air compressor with at least a 26 gallon tank is recommended. Get stuff done faster and easier with Campbell hausfeld-the air power expert. 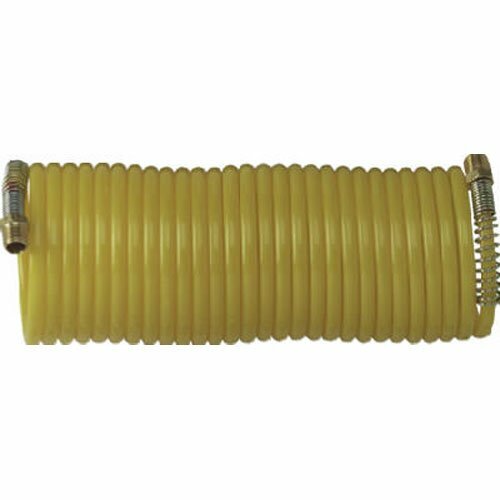 The item is Campbell Hausfeld 25' 1/4-in Nylon Recoil Air Hose . Used for Pneumatics, Pneumatic Fasteners & Accessories. The product is manufactured in China. The Campbell Hausfeld get stuff done straight die Grinder (XT250000) boasts the power to handle grinding, porting, smoothing, polishing and deburring with ease. With a 25,000 free speed RPM and a .2 Horsepower motor, the XT250000 moves material quickly and efficiently. 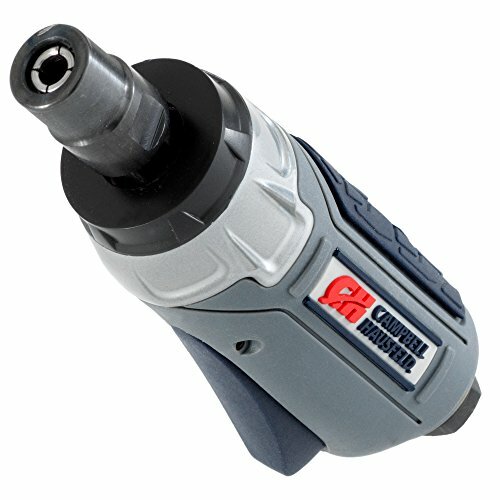 The multiple air flow adjustments allows for seamless control – all you need is a Quick turn of the screwdriver! the ¼ inch collet makes this straight die Grinder compatible with most standard bits. This die Grinder boasts a lightweight composite design (0.8 lbs. ), and a rubberized, comfort grip for a user friendly experience. Average air consumption of 2.8 CFM @ 90 PSI. Maximum pressure of 90 PSI. Air inlet size of ¼ inch NPT (F). minimum hose size of 3/8 inch. An air compressor with a tank gallon capacity of 20 gallons or larger is recommended. Get stuff done faster and easier with Campbell Hausfeld. The Air Power Expert. 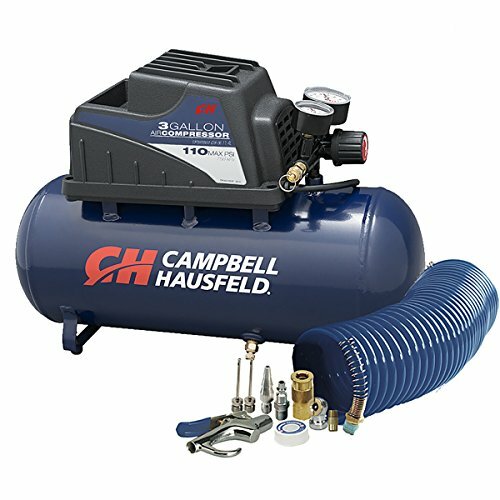 The Campbell Hausfeld 3-gallon air compressor kit (FP209499) can handle multiple projects. This air compressor’s 3-gallon size makes it a great inflator for car tires, bike tires and sports balls; it’s also perfect for powering air brushes as well as air nailers and brad nailers to install trim, complete furniture upholstery projects and more. The conveniently placed gauges are easy to read and this air compressor’s compact design makes it easily portable. Oilless pump for maintenance-free ownership. Includes a 10-piece accessory kit so you can get started on projects right away. Operates on 120-volt household current. 110 Max PSI, 0.36 CFM @ 90 PSI. Finish your projects faster and easier with Campbell Hausfeld - The Air Power Expert. Looking for more Campbell Hausfeld Pneumatic Air similar ideas? Try to explore these searches: Plastic Crossbow, Adidas Nba Hat, and Salsa Seed Kit. Look at latest related video about Campbell Hausfeld Pneumatic Air. Shopwizion.com is the smartest way for online shopping: compare prices of leading online shops for best deals around the web. Don't miss TOP Campbell Hausfeld Pneumatic Air deals, updated daily.